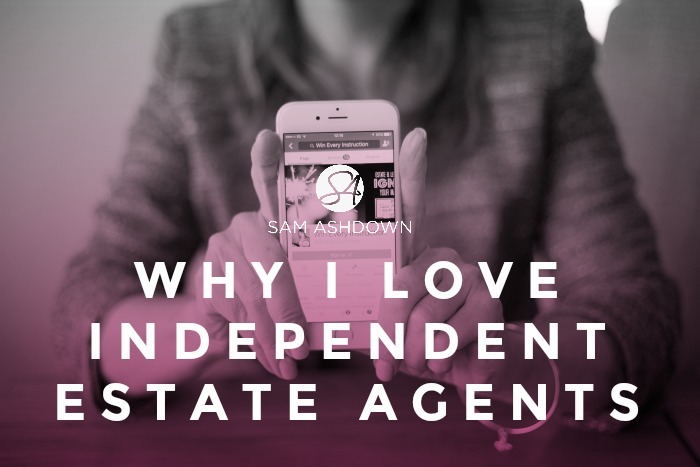 I love independent agents. I love you because you give your heart and soul to what you do. You miss parties and nights out; you stand in the rain on a Saturday watching your kids run around a muddy field, then go straight to a viewing. Your alarm clock always goes off too early; you miss your favourite tv programmes because you just need to send that last email. You see a chink of blue sky and rush off to photograph the front of a house, or bring washing in when you’re on a viewing, because your vendor is at work. You shoo cats, stroke dogs, smile at unruly kids, pat the hands of worried pensioners, you can reel off the numbers of the best window cleaner, conveyancer, storage company, plumber, dog walker and computer repairer. You give hope when there seems to be none and kind words even when you’re angry. You make your clients your friends. You’ve no idea what you’re doing on social media but you do it anyway. Even when your team have made the most atrocious mistakes: overslept, forgotten keys, lost paperwork and accidentally sent rude emails, you still bring them in cakes on a Friday, remember their birthdays – and give them time off for their kids’ assemblies. You do Movember, Stoptober and half kill yourself on fun runs. You take your laptop to bed and then toss and turn over that house that just won’t sell. You smile when locals accost you in the street, the supermarket and the pub, and ask you for a ‘ballpark’ value of their home. You’re the mavericks; the go-it-aloners; the differentiators; the disruptors. You’re stubborn and bloody-minded, but you’ll do anything for your clients: park down the street, bring flowers, make beds and wash dishes. You advise, cajole, persuade, reassure, guide, support and LOVE them. You have guts and grit; you climb a mountain every single day, and smile through each under-val, fall-through, gazump and gazunder, sharing unending pragmatism and optimism, whilst displaying courage and humility. You are the true spirits of estate agency in our fine country. You are the small and the brave.